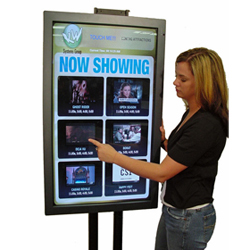 Transform static signage into a dynamic two-way communication channel. Manage content publishing across your entire screen network from one central location. Drive new customers into stores and to the cash register with relevant, high impact messages. Digital displays can range in size from an iPad to a multi-screen video wall, and positioned instore as a stand-alone unit or as part of an existing multi-screen network. Announce new products and time-sensitive promotional offers. Promote multiple brands or products via an animated show reel. Strengthen your relationships with shoppers in innovative and entertaining ways at the point-of-purchase.